When in Galle, I never forget to treat myself to a black cherry gelato at Peddler’s Inn. I had my first Mediterranean gelato experience in Barcelona, Spain. That was a generous scoop of ‘Crema Catalana’ (Spain’s version of crème brûlée), sprinkled with some cinnamon powder. It was heavenly. From Costa Brava to Madrid in North and Cordoba to Sevilla in Andalusia, the charming gelato shops in Spain seem to call your name from every nook and corner. “Quieres un helado?” “Si, por qué no!” Would you like an ice cream? Yes, why not! 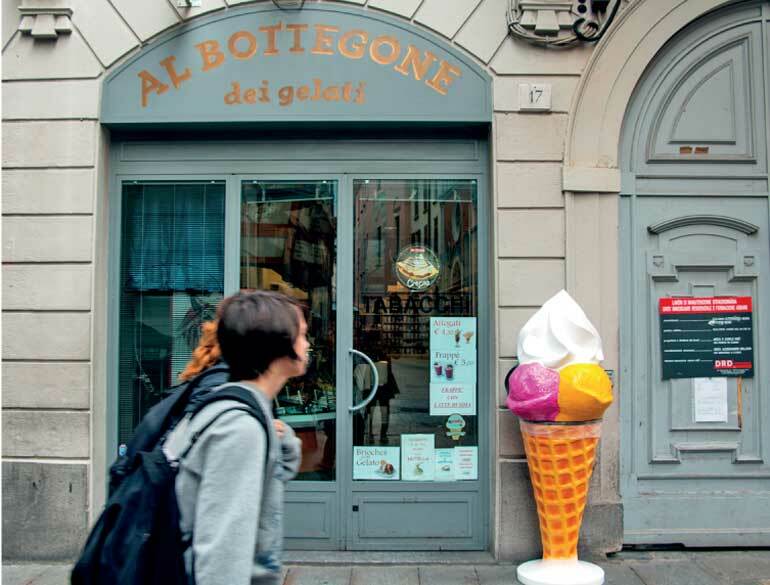 Europeans have an ardent affair with gelato, a frozen treat often enjoyed as a walking dessert, from the seat of a garden terrace, hip bistro or a lively piazza, watching life go by in the streets. I scream, you scream, we all scream for ice cream! Rah! Rah! Rah! Frosts and malts that are peppered and salted, Sis-boom-bah! The most popular ode to ice cream around the world was first published in 1927, with words and music by Howard Johnson, Billy Moll, and Robert King. A serving of rich gourmet ice cream or a saucy sundae with a cherry on top brings out the inner child in you. Ice cream was designed to make us happy. In times of unbearable humidity and dust, gelato comes as a cold comfort. Growing up in the tropics, ice cream was a staple for me when I needed a respite from the heat. Gelato is a year-round delight. The therapeutic effect of a scoop full of rich creamy goodness can heal your blues and relieve your senses, during winter or even monsoon. The word gelato derives from the Latin verb gelare (to freeze). 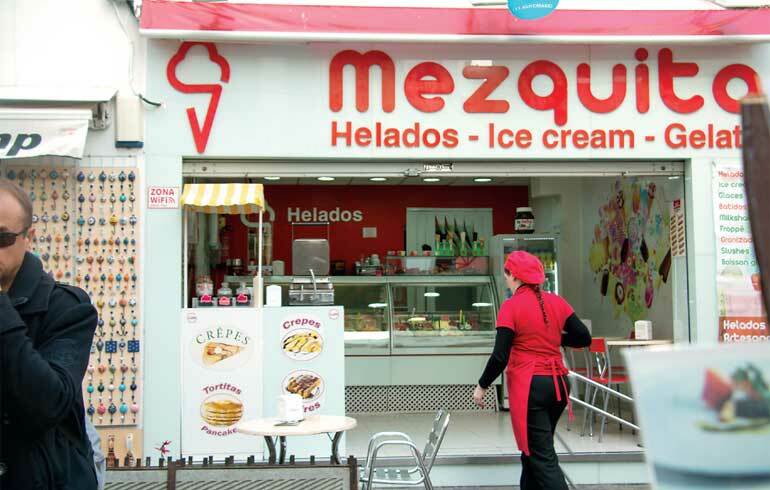 In Greece and Italy it is Gelato, in France, Glace, Helado in Spain and Sorvete in Portugal. The word gelato itself brings a whiff of freshness along with the tantalising aromas of hazelnuts, pistachios, cacao and vanilla beans. A gelato connoisseur will know the unparalleled satisfaction and the thrill of finally finding your scoop of choice after navigating the seemingly endless options of cups, waffle cones and flavours. Seeking out the real thing that appeals to your palette is worth the time and effort. Gelato is made with raw and organic ingredients that make the natural flavour of the blend stand out. Compared to ice cream, it has a more intense flavour and a denser texture, due to the inclusion of more solids and less air. Gelato is one of the most sacred of culinary traditions – this heavenly essence is best indulged when paired with a striking vista, like the panoramic Croatian coastline, the view of Venice, or the canals of Amsterdam. 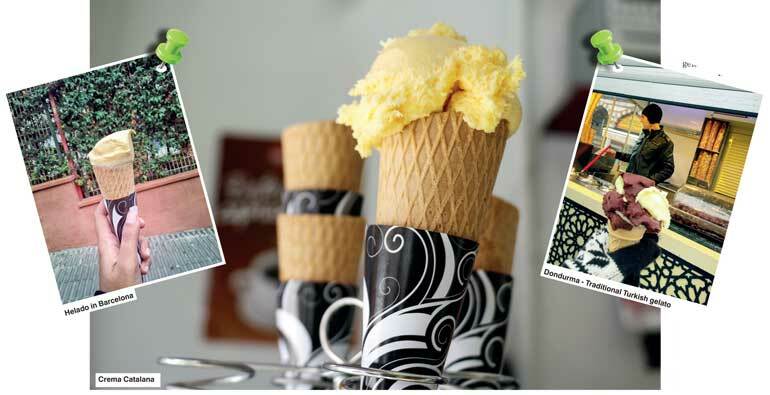 The traditional Ottoman ice cream is known as ‘Dondurma’. It comes from Turkey, Greece and the Levant region of the Mediterranean. Turks make magic out of a dough made with ‘Salep’. (A thickening agent, a flour made from the root of a type of orchid and mastic (a resin from the mastic tree). This fascinating, stretchy, chewy concoction is twirled around with long metal sticks by vendors dressed in a Maraş costume. Buying a cone of Dondurma is a not-to-be-missed touristic experience in Turkey. Unlike its soft Italian cousin, Ottoman Dondurma has a distinctly smoky taste and a chewy texture. It takes a good long while to melt, so enjoy your treat while exploring the streets of Istanbul on foot. When in doubt, go for the old favourites of chocolate and vanilla. You can also select between a range of Western, Mediterranean and Middle Eastern classics of pistachio and almond, and Turkish specialties such as cherry and mulberry. Gelato is an age-old frozen delicacy that dates back to thousands of years. The Arabs were the first to develop the kind of fruit ice that the Italians called sorbetto. In 2500 BC, the Egyptian pharaohs offered their guests a cup of crushed ice and sweetened with fruit flavourings. It’s believed that the Chinese seem to have invented milk-based ice cream, which Marco Polo described on his return from the mountains and deserts of East. It was during the Italian Renaissance that the great tradition of Italian gelato began. In the late 1500s, the Medici family commissioned famous artist and architect to prepare a beautiful feast for the visiting King of Spain. Bernardo Buontalenti used his exceptional culinary skills to present an elaborate and aesthetically pleasing treat to the King of Spain. Buontalenti is considered the inventor of this creamy frozen dessert that we now call gelato. “The ideas for both frozen desserts were brought to France by a cook named Bernardo Buontalenti, either with Caterina de’Medici in 1533 or with Maria de’Medici in 1600. It was, however, a Sicilian who made custard-based ice cream, a wildly popular and fashionable confection. Francesco Procopio dei Coletti, an impovershed Palermo aristocrat, emigrated to Vienna in 1672, first to work for a coffee purveyor, then as owner of his own coffeehouse. Before long he ran a chain of such cafes throughout Central Europe, then took the idea to Paris in 1675, where he opened the Cafe Procope...where he began selling Viennese-style ices and, before long, custard-rich ice creams. Coffee houses in Italy followed the Paris model, and gelato became hugely popular. In Italy today, the best ice creams in Italy are made by local gelaterie...” – The Dictionary of Italian Food and Drink, John Mariani [Broadway Books: New York] 1998 (p. 115-6). Nobody does gelato better than Italy. Italy has long been associated with its rich culinary culture. Just like pasta, pizza, truffles, olives and wine, gelato has to be Italian to be authentic. Italy makes the creamiest, smoothest and the most flavourful gelato in the Mediterranean. Authentic Italian ice cream is all about ingredients. The broadening palette in Italian gelatarias will spoil you with an assortment of vibrant flavours to choose from. It can be a challenge to choose which are truly worth your euros with an array of regional favourites and seasonal specialties made from fresh local produce. Amalfi lemon and Sicilian almond for homemade goodness or would you like to be a bit more adventurous with artichoke, mango, whisky, rhubarb and other exotic spices? It’s hard to choose from the combinations of flavours when you opt for two scoops. Dark chocolate and peach-champagne or frozen berries with French vanilla? That’s never too much to ask. As you stroll the cobble-stoned streets of medieval European cities, you’ll find yourself gravitating towards opulent gelato havens on the boulevards and creative little artisan glaciers in Gothic quarters. Travellers like me simply cannot resist the temptation of seeing the freezers that are filled with mountains of gelato blobs and fruit sorbets, each topped with a piece of fruit or a chunk of chocolate, candy, or coconut. You indulge and keep going back for more, because every new flavour that you try takes you to an entirely different gastronomical adventure that connects you with its culture.